Such descriptions were once typically associated with turtle soup consumption, a long-standing epicurean delight in both England and the United States during the latter part of the 18th and early 19th centuries. Perhaps you had not realized how popular turtles were on the dinner tables of people in these two countries, and most particularly of Philadelphia, the city whose eating habits will be spotlighted here. Well, read on my friends, for what follows will reveal much about the prominent place these reptiles had in the foodways of our early ancestors in this great city. In point of fact, turtle meat has been a quintessential component of Philadelphia cuisine since pre-revolutionary days. 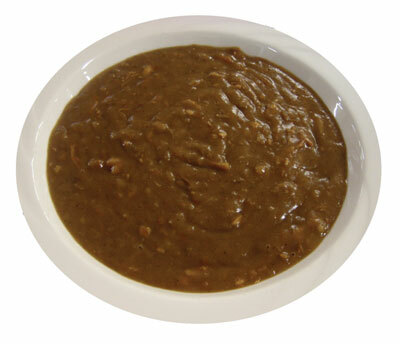 Turtle soup in particular developed as a high-status dish, first in England and subsequently in the colonies. Philadelphia had its own unique style of preparing the soup that included a serving of sherry, which was to be added to the soup just prior to consumption. Over the years, turtle soup emerged as a Philadelphia speciality and came to represent some of the best cuisine the city had to offer. The availability of a variety of turtle species throughout the history of settlement in the area, whether in the local landscape or acquired through trade, readily facilitated various turtle preparations. The iconic nature of turtle soup in Philadelphia’s culinary history is still apparent today as restaurants such as the Sansom Street Oyster House, the Union League, and Pearl’s Oyster Bar in the Reading Terminal Market continue to offer the dish on their menus. This soup was once as evocative of Philadelphia’s culinary culture as the cheesesteak is today. 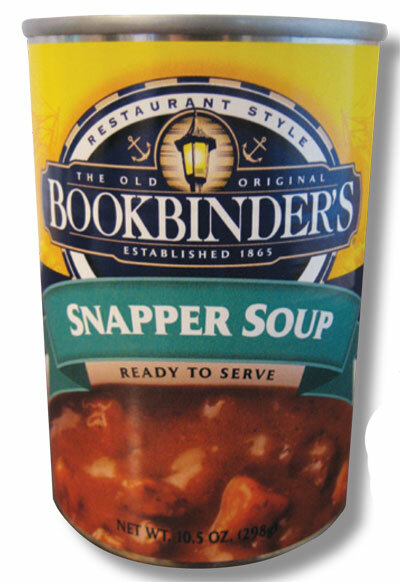 The eminent Old Original Bookbinder’s restaurant not only prepares the dish for its dining patrons, but even sells a canned version of snapping turtle soup. 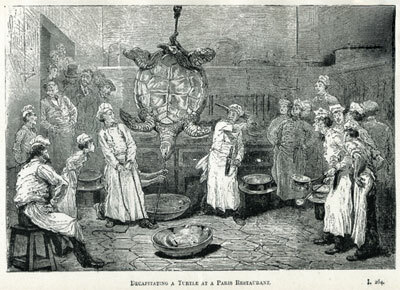 In the early colonial period, cooking with turtle mainly involved the large ocean-bound green sea turtles, which, as the well-known 18th century cookbook author Richard Briggs noted, could vary in size “from one pound to eight or nine hundred weight” but were more often in the range of 50 to 300 pounds. These turtles were typically imported from the West Indies, along with other exotics such as guavas, coconuts, limes, plantains, and bananas. They would arrive in the city as often as three times a week, where they were auctioned off dockside, generally to taverns and caterers. Because of the size of these creatures, they were frequently served at large banquets or festivals, to which advance tickets were often sold due to the tremendous demand. Taverns and hotels took out advertisements in local newspapers to announce an upcoming turtle extravaganza. In the absence of any specific event, there were also places in the city that routinely prepared and sold turtle soup. Given the overall high status of this dish and the difficulty of preparing it in the home, it would not have been uncommon for wealthier households to purchase turtle soup when it was available ready-made. An advertisement placed in The Philadelphia Gazette and Universal Daily Advertiser in August 1801 points to one location where this would have been possible: “Turtle Soup Kept by the Subscriber, North Water street, between Arch and Race street, No. 85, on Mondays, Wednesdays, and Saturdays, from Six to Nine o’clock in the evening. N.B. Jabis Stockman.” Eliza Leslie, the great 19th century Philadelphia cook and cookbook author, purposefully omitted “a receipt [recipe] for real turtle soup, as when that very expensive, complicated, and difficult dish is prepared in a private family, it is advisable to hire a first-rate cook for the express purpose. An easy way is to get it ready made, in any quantity you please, from a turtle-soup house.” She clearly considered it best to rely on the professionals for this particular dish. Visitors to the Philadelphia area noted the prevalence of turtles on the culinary landscape. Gottlieb Mittelberger, a German traveler who lived in Pennsylvania for four years, wrote in the early 1750s, “Turtles I often saw of a size that it took a man to carry one” in describing the reptilian sights in the Philadelphia market. And none other than the illustrious John Adams recorded in his diary on several occasions that turtle appeared on the dinner table during the course of the many entertainments he enjoyed while visiting Philadelphia for the First Continental Congress. Frances Anne Kemble, a well-known British actress and author who came to the States accompanied by her father in 1832, was apparently none too fond of turtles. 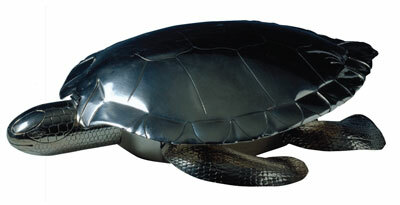 She mentions specifically the terrapin, a local substitute for the green sea turtle. Francis wrote in her diary in December 1832: “Came home, and supped. I had eaten nothing since four o’clock, and was famished; for I do not like stewed oysters and terrapins, which are the refreshments invariably handed round at an American evening party.” Though she may have made this remark in reference to American dinner parties in general, we know that she was in Philadelphia at the time. This serves as yet another indication of the prominence and preeminence of the turtle on the menus and tables of the residents in this region. In September of the same year Miss Kemble noted with some distain that her father “set off with Colonel…[illegible] for Hoboken; a place across the water, famous once for dueling, but now the favorite resort of a turtle-eating club, who go there every Tuesday to cook and swallow turtle.” The invitation card which had enticed the men to this destination read: “Sir, the Hoboken Turtle-Club will meet at the grove, for spoon exercise, on Tuesday, the 11th inst. by order of the President.” Clearly, to these gentlemen, turtle was considered a food worth traveling for and one that served as the centerpiece of meals and eating clubs, even if it lacked this appeal for the younger Miss Kemble. Recipes for sea turtles were very complex, not to mention pricey, and were often the longest “receipts,” as they were called at the time, in cookbooks from the 18th and 19th centuries, running to four, five, or even six pages. This was in large part because, as an exotic creature, turtles were not frequently encountered by most home cooks and so the simplest task had to be explained: from killing techniques, all the way through what to do with each part of the animal. Another reason why turtle recipes were so long-winded was that there were multiple dishes involved in their preparation. Although turtle soup was the most popular and became the most famous of the dishes, many period cookbooks gave instructions for between five and seven distinct dishes that came out of butchering and preparing a single sea turtle. In Hannah Glasse’s 1751 edition of The Art of Cookery, Made Plain and Easy, the earliest English cookbook to include a recipe for turtle, aside from the soup there was a dish highlighting the calipash (the back shell), one for the calipee (the belly), a dish made from the offal (entrails), and one from the fins. These dishes were then designated specific locations on the table for service. Elizabeth Raffald, who gave instructions for preparing seven dishes from a turtle weighing a hundred pounds, writes in The Experienced English House-keeper (1769) “N.B. The first Course should be of Turtle only, when it is dressed in this Manner; but when it is with other Victuals, it should be in three different Dishes; but this way I have often dressed them, and have given great Satisfaction.” She indicates here that there were occasionally entire courses made up of turtle, or, if the host so chose, the turtle dishes could be intermingled with other fare. Both options, however, were sure to be met with approval from the guests. And though we know most British cookbooks would have been available on both sides of the Atlantic at this time, it is important to note that Amelia Simmons, who authored the first truly American cookbook, published in Hartford, Connecticut, in 1796 with the none too ambiguous title of American Cookery, included a recipe for “To Dress a Turtle,” though she only had 39 recipes in total. Should one choose to undertake the rather daunting task of preparing turtle in the home the animal first needed to be killed—either by beheading or slicing the throat—and subsequently bled. In some recipes, such as that offered by Simmons in 1796, the blood was incorporated into the turtle preparation. Her dish was more like a turtle casserole than a soup or stew. After the draining of the blood, the fins were removed and the calipee or belly (including the lower shell or plastron, fat, and meat) was cut off. Next, the rest of the meat, bones, and the entrails were removed from the back shell except for the green fat that lined the shell, known as the “monsieur.” This fat, rather than any external visual characteristics, was the reason these outwardly brown turtles were known as green sea turtles. The monsieur would be baked onto the shell, along with some seasoning, before the soup was put into it, giving it a richer flavor and texture. And the shell was the only noticeably turtle component that would have been displayed on the table when the final dishes were served. Once the butchering steps were complete, the preparation of the various dishes would begin. 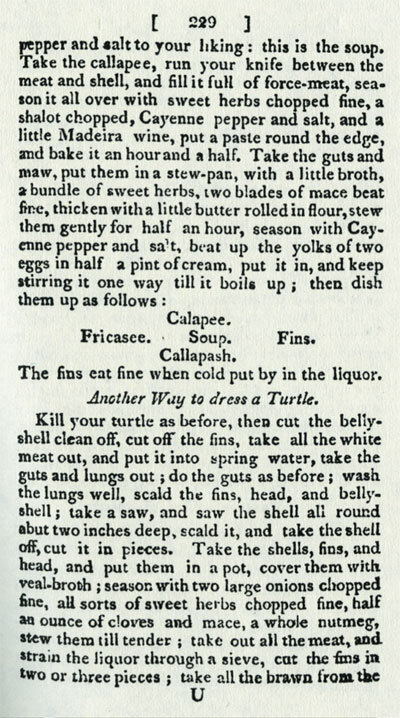 Provided here is the portion of the recipe describing the steps involved in making turtle soup from Elizabeth Raffald (1769). Take the Head, skin it and cut it in two Pieces, put it into a stew Pot with all the Bones, Hearts, and Lights to a Gallon of Water, or Veal Broth, three or four blades of Mace, one Shalot, a slice of Beef beaten to Pieces, and a bunch of Sweet Herbs, set them in a very hot Oven, and let it stand an Hour at least, when it comes out strain it into a Tureen for the Middle of the Table. The popularity of turtle dishes in both British and American cuisine in general is corroborated by the increasing prevalence of turtle-based recipes in subsequent editions of the same cookbook. Take, for example, Eliza Smith’s The Compleat Housewife, or, Accomplished Gentlewoman’s Companion, which in its 1753 edition had only one turtle recipe, but by 1773 had five, two of which were “mock turtle,” a topic upon which we will touch in a moment. Turtle soup was known principally for its dull-green color, delicate taste, and gelatinous mouth-feel and was so popular that turtle- shaped tureens were produced specifically for its presentation on the table. This beautiful fused-plate example from England is 16.5” long, 17.25” wide, and 9.75” in height. It dates to between 1800 and 1830, and is part of the Campbell Collection of Soup Tureens on display at Winterthur. The turtles referred to in these recipes are the sea turtles of West Indian fame, and cookbook author Richard Bradley describes their taste as follows “Its Flesh is between that of Veal, and that of Lobster, and it is extremely pleasant, either roasted or baked.” The color of the turtle’s raw meat was also quite similar to veal. Given the similarities between veal and turtle meats, it is rather unsurprising that veal broth and meat were ingredients often found in recipes for turtle soup. Mock turtle recipes developed as a substitute for the real thing. They frequently incorporated calves heads and/or feet and attempted to mimic the flavor and gelatinous texture of their turtle-based counterparts. Mock preparations were popular because their ingredients were readily available and these ingredients also tended to be more affordable. The overall size of a calf’s head in relation to a giant sea turtle made their preparation in the home a more manageable undertaking as well. Most cookbooks of the day that had turtle recipes also included at least one mock turtle preparation. Eliza Leslie published a long list of potential menus in her 1847 book The Lady’s Receipt-Book; A Useful Companion for Large or Small Families. Of the seven that mentioned turtle, five were mock preparations, clearly demonstrating the more approachable nature of these types of recipes. Given the clearly expanding popularity of turtle recipes, but hindered by declining sea turtle populations, their limited season, their ever-rising prices, and an unpredictable market, people eventually turned to locally available turtle resources to fulfill their culinary needs. Enter the terrapin…a turtle native to the brackish coastal swamps of the eastern and southern United States. The two most popular varieties were the Egg Harbor terrapin, available in the Delaware Bay, and the more well-known diamond-back terrapin from the Chesapeake Bay. Thomas DeVoe, a New York City butcher in the mid-19th century, wrote that the diamond-back terrapin was “the best of the turtle tribe. They are usually cooked with the shell on for the various dishes, and considered best and fattest in the months of November, December, and January.” The females were the most sought after, not only because the most-highly prized contained eggs (these were referred to as “full cows”), which were served as a select garnish in the soup, but also because they were more tender. The males, called “bulls,” were sold in the hundreds and were used for little else than soups. 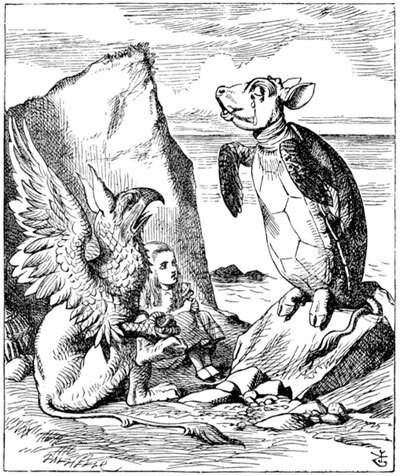 Yet Artemas Ward, writing a little over half a century later, notes “The diamond-back terrapin is wasted on any one save an epicure of very discriminating palate, and even on him unless it profit first by the service of a culinary adept, for the difference in flesh between the true diamond-back and many masquerading counterfeits is so slight that only the combination of high professional skill and a keen palate justifies the enormous difference in price. The flesh of the diamond-back and various of its substitutes is alike in being highly gelatinous and in owing fame chiefly to its adaptability and quick response to skillful cooking.” Ward likely advocated more limited use of the diamond-back at this time because they had become a scarcer commodity. Several Philadelphia chefs rose to prominence in the early to mid-19th century for their terrapin cooking skills. Elizabeth Rubicam, who along with her husband Daniel owned the Washington Hotel at 20 South 6th Street, was both cook and caterer and was considered to be not only the city’s but “America’s premier terrapin cook.” And Robert Bogle, one of the leading Black caterers in Philadelphia, was also well respected for his terrapin preparations. Those of you familiar with turtle soup in the Delaware Valley today may be wondering why there has been no mention thus far of snapping turtle soup, since this is the turtle variety most often used in modern local recipes. This is because recipes for snapper soup are, by and large, absent from cookbooks in the 18th and 19th centuries. Though snapping turtles were available locally, like the terrapin, and would have been a logical and readily available source of turtle meat, they, for whatever reason, did not receive the same level of press as the other varieties discussed so far. Despite the lack of recipes, several travelers to the Delaware Valley do mention consuming snapping turtles. Robert Sutcliff noted from his travels in 1805, “Here [along the Schuylkill River near Philadelphia] is also a great abundance of that kind of tortoise called the snapping turtle, which makes very good soup; and, as far as I am able to judge, nearly equal to that made from the sea turtle.” And James Mease made an off-hand reference in his Picture of Philadelphia (1811) to the “amphibians” (turtles are actually reptiles) of the region being snapping turtle and terrapin, “both excellent.” This is the extent to which the snapping turtle appears in the historical record. Yet, contrary to what the documentary record might lead you to believe, the snapping turtle is much more visible in the archaeological record than either the sea turtle or terrapin. This disjuncture provides the perfect transition to examine more closely the archaeological evidence for turtles in the City of Brotherly Love. 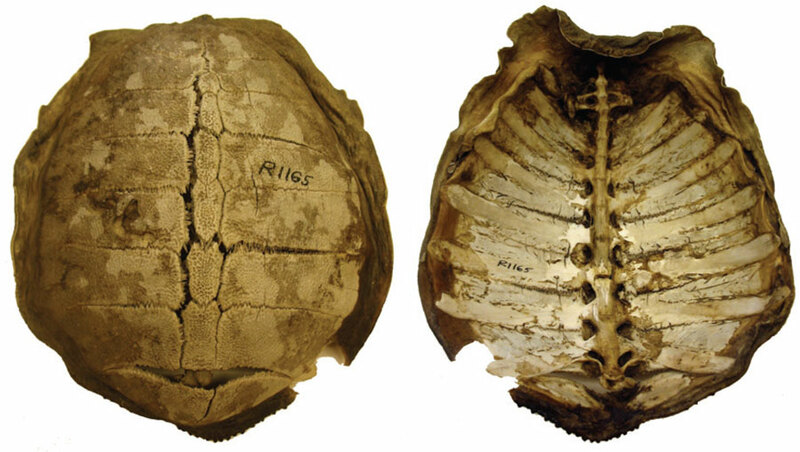 The exterior and interior views of a turtle shell. Notice the various plates or scutes that latch together to form the complete shell. These plates are often recovered individually in archaeological contexts. Evidence from historical documents provides a firm grounding for understanding the importance of turtle soup in reconstructing Philadelphia cuisine in the 18th and 19th centuries. But these sources naturally offer a limited view of what dining was actually like in the past. For example, cookbooks recorded recipes utilized principally for preserving or for special occasions (i.e. those not used in everyday routines). Diaries and letters highlighted significant events, but neglected mundane culinary practices or, at the very least, could not be relied upon to provide consistent and comprehensive information about eating habits. Newspaper advertisements offered a window into what was available for sale in the marketplace, but not what people were actually purchasing. This is where the archaeology of food can help to fill in some of the gaps, raise new issues, and ultimately aid in an overall more nuanced reconstruction of foodways in the past. Zooarchaeology, or the archaeology of animal bones, can provide evidence for the spectrum of animals that were eaten, and therefore point to the kinds of turtles which were appearing on the tables of people in the city. From the available zooarchaeological data dating to the late 18th and early 19th centuries in Philadelphia, there are two species of turtles that appear consistently—the snapping turtle and the box turtle. As mentioned, snapping turtles do receive minor recognition in the extant literature, so their presence in the archaeological features is not entirely surprising. What is unexpected is the lack of evidence for either sea turtle or terrapin. The absence of sea turtle bones might be explained by the contexts in which the bones were found. As we have discussed, the preparation of a sea turtle was a major undertaking, often left to tavern kitchens and caterers serving large numbers of people. Given this fact, it is much less likely that archaeologists would recover sea turtle bones from household contexts, and though several of the archaeological features that have been excavated in Philadelphia were associated with taverns, not every tavern had turtle soup on the menu. As for the lack of terrapin bones, this, for the present, remains a mystery. It is true that terrapin was, like sea turtle, a catered food; however, its smaller size and greater accessibility would have made it a much more likely candidate for household kitchens. Yet another unanticipated result from the zooarchaeological data is the abundance of box turtles in these 18th and 19th century deposits. In several of the archaeological assemblages they are the most plentiful turtle. Part of the dilemma with finding these turtles in any archaeological feature is that it is difficult to determine if in fact they were actually eaten or if they may have been either a discarded household pet or crawled into the trash pit to hibernate in the winter and never woken up. Box turtles have a long tradition as a food source in North America, having been an important component of Indian diets, particularly that of the Iroquois. And some culinary historians claim that European colonists did eat the occasional box turtle, though they may have preferred other varieties. Given their preference for woodland environments, box turtles, like snapping turtles and terrapins, would have been available on the landscape in and around the city, and there- fore readily available for those people who did wish to utilize them for culinary purposes. Soft shell turtle also appeared in one archaeological assemblage from Philadelphia. Thomas DeVoe noted, “The flesh is much esteemed as wholesome and nutritious food.” These creatures too would have been locally available and would have made excellent turtle soup. Since they live in rivers, streams, lakes, and ponds, their presence in an archaeological deposit downtown suggests that they could not have arrived there accidentally and were almost certainly eaten. Reflecting on these archaeologically recovered turtle remains as a whole, it is notable that all the specimens came from smaller turtles—box and soft shell turtles being relatively small turtles in general. 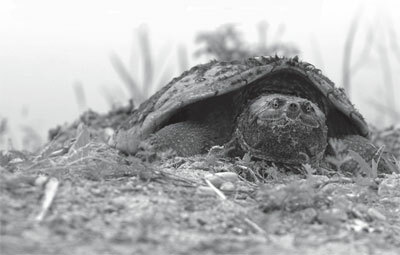 Even the recovered snapping turtles, which can grow up to 50 pounds or more, tended to be on the smaller end of the spectrum, likely younger individuals. All of these turtles were significantly smaller than even the smallest green sea turtles used for cooking. An interesting side note is that smaller turtles were purported to be desirable for their more tender flesh. So these turtle selections may not only reflect convenience on the part of these Philadelphia households, but intentional culinary choice as well. The Union League of Philadelphia, founded in 1862, still serves traditional snapping turtle soup today. If you can finagle yourself an invitation to the club, take the opportunity to try this luscious version of the soup made with a roux base and sherry added for that traditional Philadelphia kick. As noted above, mock turtle preparations were also quite popular during the heyday of turtle soup consumption in Philadelphia. Archaeological evidence for calf skulls and foot bones in the same archaeological assemblages as the turtle bones suggests that mock turtle preparations may also have been prepared and served on the dining tables of these households. It is harder to say for certain what these particular cuts of meat were used for, since they were utilized in multiple ways in the cuisine. But it is plausible to suggest mock turtle preparations given their presence in contexts associated with families that display a preference for turtle soup or other turtle dishes, in conjunction with the known popularity of all turtle and mock turtle preparations during this period. Ultimately, what becomes clear from scrutinizing the animal bones is that the kinds of turtle soup that were being prepared and consumed in the home were much different from those mentioned in the majority of the historical documentation of the period. From a documentary perspective we might suppose that sea turtles, terrapins, and the occasional snapping turtle were the species of choice in Philadelphia, yet archaeological evidence does not entirely agree, providing evidence for snapping, box, and soft shell turtles. This study of turtle soup serves as a prime example of the benefits of a synergetic relationship between historical and zooarchaeological research. Although it is apparent from both research angles that turtles played an important role in Philadelphia cuisine during the 18th and 19th centuries, these two distinct sources present unique and equally significant information about the kinds of turtles and even the prevalence of this dish in people’s overall diet. Combining these two perspectives helps generate a more evenhanded view of culinary practices in the past, with the disjunctures between the two sources leading us to new questions and insights. DeVoe, Thomas F. The Market Assistant. New York: Hurd and Houghton, 1867.Glasse, Hannah. The Art of Cookery, Made Plain and Easy. London: printed for the author, 1751.Hines, Mary Anne, Gordon Marshall, and William Woys Weaver. The Larder Invaded: Reflections on Three Centuries of Philadelphia Food and Drink: A Joint Exhibition Held 17 November 1986 to 25 April 1987. Philadelphia: Library Company of Philadelphia and Historical Society of Pennsylvania, 1987. Leslie, Eliza. The Lady’s Receipt-Book; A Useful Companion for Large or Small Families. Philadelphia: Carey & Hart, 1847. Raffald, Elizabeth. The Experienced English House-keeper. London: H. and G. Mozley, 1800. Smith, Eliza. The Compleat Housewife; or, Accomplish’d Gentlewoman’s Companion. 15th ed. London: Printed for R. Ware, S. Birt, T. Longman, C. Hitch, and J. Hodges, J. and J. Rivington, J. Ward, W. Johnston, and M. Cooper, 1753. Ward, Artemas. The Grocer’s Encyclopedia. New York, 1911. Ward, Artemas. The Encyclopedia of Food. New York: Peter Smith Publishers, Inc., 1923. Weaver, William Woys. Thirty-Five Receipts From “The Larder Invaded.” Philadelphia: Library Company of Philadelphia and Historical Society of Pennsylvania, 1986.